It's day two of Holiday Craft Party from Simply Kelly Design and myself. We are so excited to share with you guys come gift tags for Christmas. Did you miss day one? Check out our ornaments here. A little over a week ago I went to a Wayfair and Boston Blogger event Home For the Holidays Boston or #HFTHBoston. It was such a fun day of crafting, home styling and menu planning. I wanted to share with you gift tags that I made with Kate from DomestiKated Life. 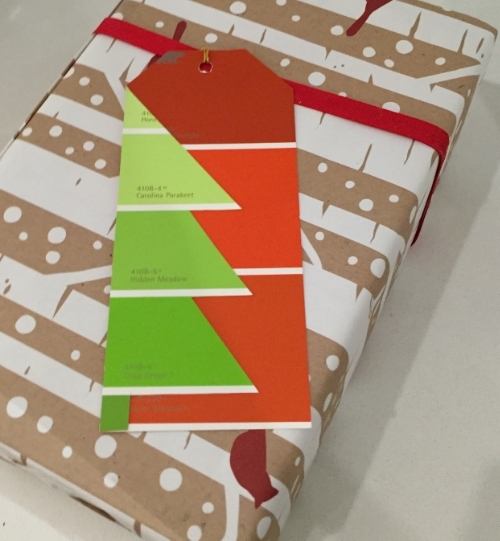 We made paint chip christmas tree gift tags. Super simple and will make a big impact on your gift wrapping. Did I mention they will cost you next to nothing to make. Step 1. Taking the paint sample that you would like to be the tree, now you don't have to just go green you can get a little funky. Start by cutting up the sample in a straight line and then meet it with a 90 degree cut. Making the trunk and the base of the Christmas tree. Step 2. & 3. Cut at a 45 degree angle and then cut straight across and repeat this three times to create the body of the tree. Please note: You can trace a tree or draw the Christmas tree if freehand is difficult for you. Step 4: Using double stick tape, tape the back side of the tree and place it on a contrasting paint chip that will be your tag. Once the tree is place trim the tag portion of your paint chip. Then punch a whole for your string or ribbon. I can't wait to bombard the hardware store for more holiday color paint chips. The possibilities are endless and fit right into my Christmas budget. I think holly and berries might be my next gift tag. Myself (left) and Kate from DomestiKated Life (right) at Home for the Holidays Boston a Wayfair and Boston Blogger event. Make sure you check out Simply Kelly Designs Christmas Gift Tags that she made out of scraps from scrapbook paper.